On Thursday, about 50 UC Santa Cruz students stood in solidarity with over 110 college campuses across the nation in the #MillionStudentMarch, calling for the cancellation of student debt, a tuition-free education and a $15 minimum wage. About 10 students dressed in all black and a few others held signs with the hashtag #ConcernedStudent1950 in recognition of the movement that began earlier this month at the University of Missouri due to escalating racial tensions on its campus. The UCSC action began with a speakout in front of the Express Store and ended at the doorway of Clark Kerr Hall. There, Student Union Assembly (SUA) members presented a letter to administration outlining their requests and demanded Vice Chancellor of University Relations Keith Brant’s signature in support. The average 2015 graduate has over $35,000 in debt, according to the #MillionStudentMarch organization, whose list of supporters begins with famous linguist and activist Noam Chomsky. Over 40 million Americans share a total of $1.2 trillion in student debt, and almost 71 percent of undergraduates will graduate with student loans this year. Milla joined a circle of people in the Quarry, some of whom held a banner reading “#DoUCmyStudentDebt,” while SUA Vice President of External Affairs Guillermo Rogel stood behind a bullhorn shouting, “If you’re drowning and you know it clap your hands.” Students clapped along and Rogel passed around the bullhorn for a discussion of students’ concerns about debt and high tuition. Echoing frustrated words from SUA Vice President of Diversity and Inclusion Sauli Itzel Colio, SUA Organizing Director Art Motta shared similar concerns in an interview regarding his $20,000 in student loans. Prop 13 is a California initiative passed in 1978 that cut property taxes by about 57 percent. Though the cut benefited individual home and business owners, it financially gutted local governments and public institutions like libraries and schools. Cities began relying on sales taxes for funding, which incentivized local governments to fund the building of retail stores and other lucrative attractions, rather than invest in public services. 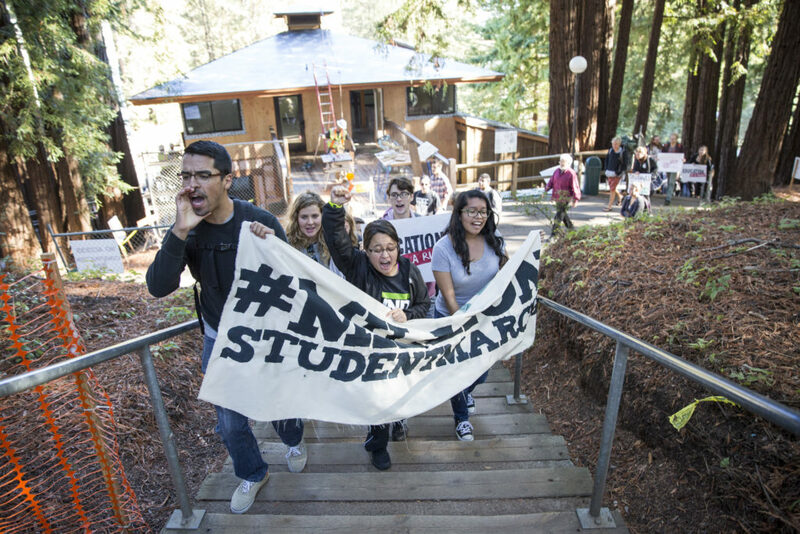 The repercussions of these systemic issues led the UCSC #MillionStudentMarch to Kerr Hall, where about 20 students marched to Vice Chancellor of University Relations Keith Brant’s office demanding he come out and hear their message. After a few moments of lingering in the hall and collective chants, Guillermo Rogel pulled out a letter which he read with a bullhorn. Brant, who oversees UCSC fundraising, marketing and community relations, never made an appearance, but Richard Hughey, vice provost and dean of undergraduate education, came out of his office to listen and respond to students’ concerns. When Rogel asked him to sign the letter in solidarity with students, Hughey said he wouldn’t right then but he would consider it after he read and discussed it with other members of UCSC administration.